Abominable Snowman Cocktail brings Winter to the party! A cocktail you can enjoy through February-at least! 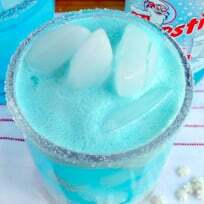 Frosty, blue, festive, and sweet! 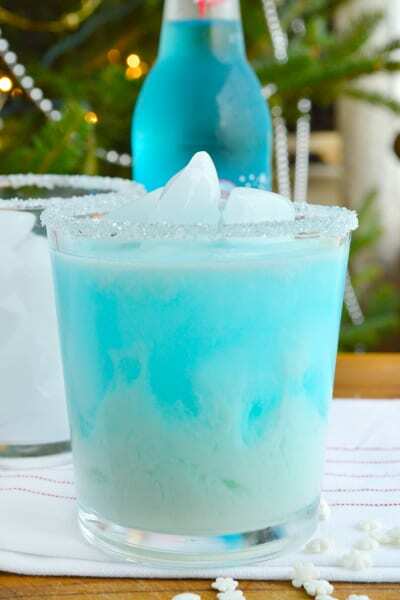 This Abominable Snowman Cocktail is creamy with a hint of cinnamon, and is the perfect drink for all your winter festivities. We are holiday lovers to the core over here. We start decorating for Halloween in September. Christmas decorations immediately follow Halloween, pausing only long enough for the uncarved pumpkins to hang around for Thanksgiving. I drink Bourbon Spiked Hot Chocolate as soon as there is a crisp in the air! And along with my penchant for excessive holiday decorations comes my serious love for holiday movies. And there is a major special place in my heart for those old crazy clay-mation-ish movies - In particular Rudolph the Red Nosed Reindeer and The Island of Misfit Toys. ABOMINABLE SNOWMAN IS MY FAVORITE!! For some reason though, I always manage to miss the movie. We had a whole conversation about how Rudolph was coming on tomorrow night and OH! We should record it, and hey -- remember Rudolph is on later. Let’s make popcorn! I am sure it is coming as no surprise that we forgot to watch Rudolph. Which means that unless I brave Wal-Mart and just go buy the dang DVD, it’s going to be a whole year before I get my Abominable Snowman Fix. 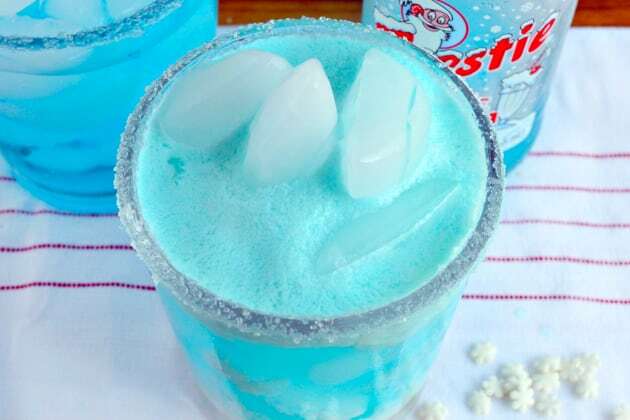 This Abominable Snowman Cocktail is so fun and festive! 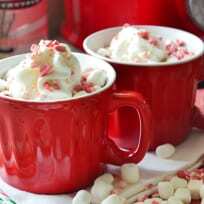 It requires only 2 ingredients -- both are creamy and sweet, one has a hint of holiday spice. RumChata is one of my favorite cordial-type liquors. It’s made with real dairy cream, Caribbean rum, and a hint of cinnamon. 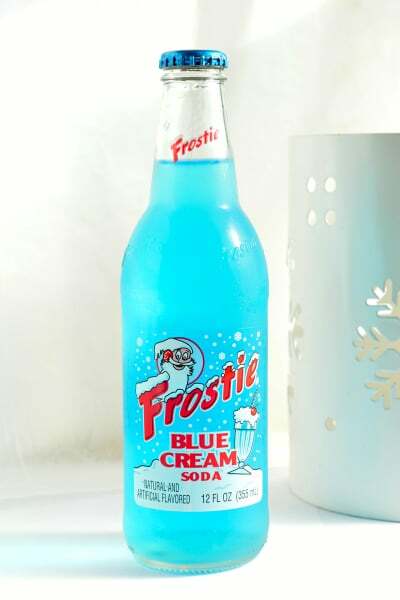 The Blue Cream Soda was a fun find. The brand I photographed and used in all my test drinks was available in my regular grocery store with the bottled root beers. 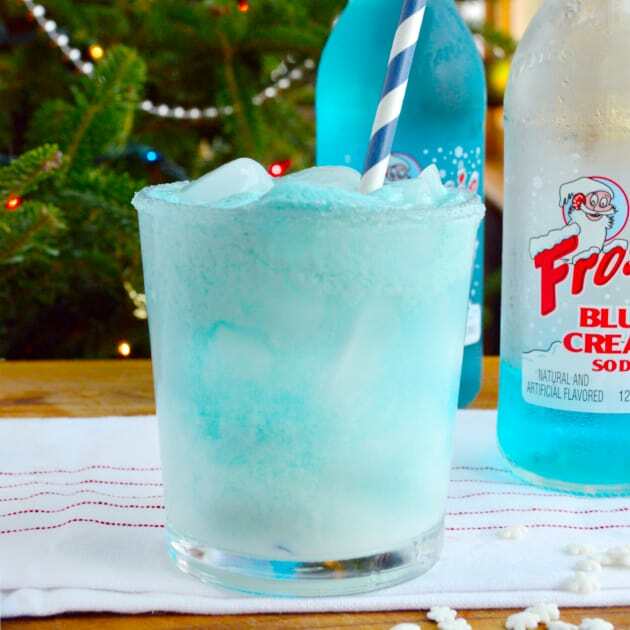 There are a variety of Blue Cream Sodas on the market, but this one was pretty festive and I think the bottles would be excellent to place in a bucket of ice on your drink table at a party! It is worth noting that you could easily make this drink non-alcoholic with horchata instead of RumChata. 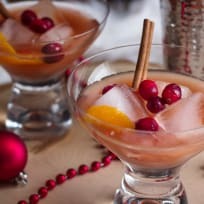 Be sure to check out some of our other amazing holiday cocktails! Two of my favorites include this Raspberry Russian Recipe and this White Christmas Cocktail! 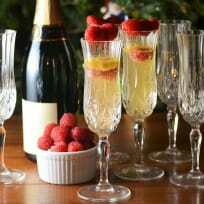 If you are sugaring the rim of your glass, place the sanding sugar in a shallow dish. 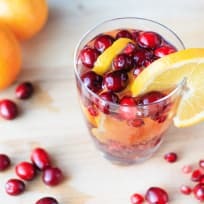 You can dip your finger in water and rub it around the rim or you can use a slice of lemon to go around the rim -- you just want it to be slightly damp so the sugar will stick. Fill a highball glass with ice and then pour the RumChata over the ice. Slowly pour the blue cream soda in to fill the glass. I like to float just another half-ounce or so of horchata over the top.